Day 1: "Quetzal", the 1987 47-foot Kaufman cutter-rigged sailboat that was to be our lodging and transportation for the next 5 days, slipped at the Bahia Mar marina. 6'-7" Harry is seen ducking out of the companionway. Fort Lauderdale's famous beaches are beyond the palm trees in the distance. With the weather not cooperating for a Bahamas passage due to winds directly out of the east at 25 knots, we agree to sail along the coast for a day or two while we wait for conditions to improve. Here is Capt. John at the helm as we motor along the Intracoastal Waterway on our way to open ocean, while Bill checks the available real estate lining the shore. Approaching the 17th St. Causeway, with the drawbridge opened obligingly for our passage. Beyond the bridge are Lake Mabel and then the Atlantic Ocean. We spent the afternoon sailing down to the Miami Beach Marina, where we spent the night. 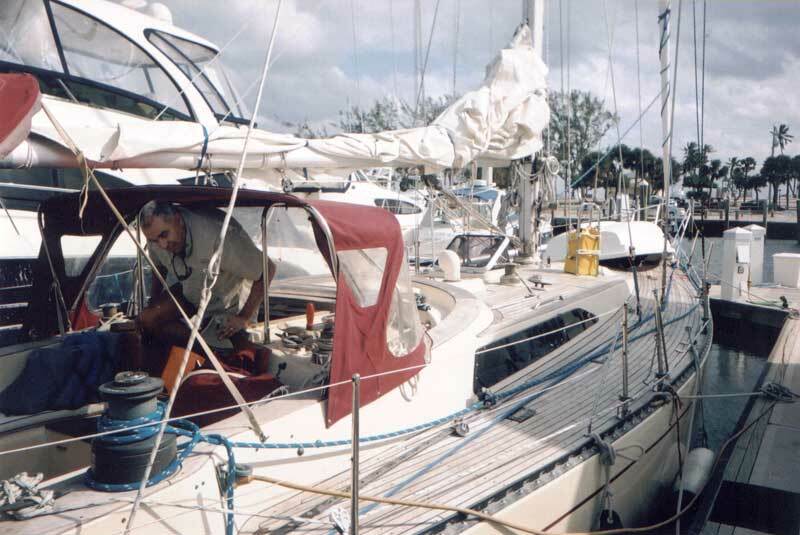 The next day, we sailed south in the protected waters of Biscayne Bay ("where the Cuban gentlemen sleep all day," according to Steely Dan's song "Dr. Wu"), ending up at the Dinner Key Marina in Coconut Grove for our second night. Day 3: Bahamas or bust! We left Coconut Grove before dawn and retraced our route north to Fort Lauderdale in order to get a good southeast tack toward Bimini before heading northeast to Grand Bahama Island. Heading out into the Gulf Stream, where John promised us the sailing would be "lumpy." Velinda had sailed us under the William M. Powell Bridge and out through the rough waters into the Atlantic. Now she was relaxing but keeping an eye on the water. Same moment, different angle. Velinda, Harry and Phil hang out in the cockpit on the morning of our Bahamas crossing. Phil appears a little damp from getting "douched" while managing the headsail from the foredeck. Day 4: We survived the night! Of course we had to make frequent course corrections and dodge all-night cruise ship traffic, but the sun rose just the same. Luisa enjoys her first cup of coffee with an unfortunate flying fish that landed on deck during the night. Bill and I pulled the first and last watch shifts, so neither of us got much sleep. Here a tired Bill mans the helm--thank goodness for autohelm--while Harry and Phil anticipate breakfast. Land ho! After almost 30 hours under sail, we spot The Settlement at the west end of Grand Bahama Island. The marina at Old Bahama Bay Resort & Yacht Harbour (http://www.oldbahamabay.com/). The water was a brilliant turquoise blue. Here is a Compac 25 sloop we shared the dock with during our brief overnight visit. Note the classic Caribbean architecture and pastel colors of the resort. Group shot on the pier in front of Bonefish Folley's restaurant. We dined on conch fritters and other seafood specialties, washed down with local Kalik beer. Left to right are me, Velinda, Bill, Harry, Luisa, Phil and Capt. John. Day 5: The voyage home took only eight hours on a smooth broad reach. Capt. John had us rig up a whisker pole on the jib and a preventer on the mainsail for performance and safety. And we finally had a chance to practice with a sextant, correctly calculating our latitude to the degree and minute. Here I am at the helm for the last time.